The global economic slowdown poses major concerns to many territories – through shortfalls in employment, household incomes, corporate profitability and tax revenues. The steel industry has been one of the hardest hit, forcing massive plant closures and redundancies from China to the UK. Austerity in public finances threatens the infrastructure required to lay the foundation for future growth and development. Economic uncertainties and uneven development also contribute to growing social unrest and new waves of international migration. Meanwhile the accelerating pace of technological change in many industries and occupations means different skills and capabilities are required of the workforce, causing painful adjustments for many communities. And looming concerns about climate change and accelerating environmental degradation complicate the task of urban and regional revitalisation. 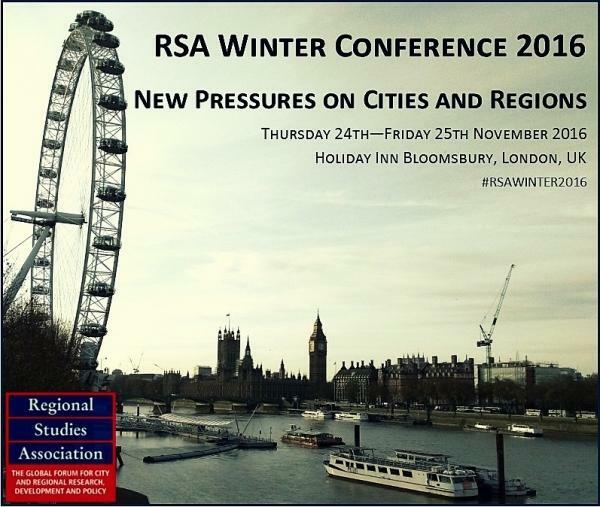 The 2016 Winter Conference of the Regional Studies Association presents a timely opportunity to discuss these issues, to clarify the research imperatives, and to consider the challenges facing policymakers and practitioners. before 24th August 2016. Proposals will be considered by the Conference Programme Committee against the criteria of originality and interest, subject balance and geographical spread. The conference is open to RSA members and non-members. RSA members benefit from a lower registration fee.Non-members signing up for the conference might wish to join the RSA to then benefit from the reduced conference fee for members and the membership benefits. *Conference and membership fee package includes the conference registration fee and 20% discounted RSA membership fee. ** The Early Career rate is for those within 5 years of the date of their PhD certificate or equivalent. *** Associate membership is for members who have retired from full-time work.